PARIS — If there's a player who shouldn't be afraid of Serena Williams' return to Grand Slam tennis at the French Open, it's certainly Garbine Muguruza. Despite an inconsistent clay-court season so far, the two-time Grand Slam champion from Spain is among the top contenders at Roland Garros. She won her first major title two years ago by defeating Williams in the final. Muguruza and Williams have played against each other five times, and the Venezuela-born Muguruza prevailed twice, both at the French Open. Muguruza's maiden victory over Williams in her second French Open appearance back in 2014 was a surprise, routing the defending champion 6-2, 6-2 in the second round. This year, the third-ranked Muguruza and Williams could meet in the quarterfinals. Williams, a 23-time Grand Slam champion, is competing in her first major since giving birth to her daughter in September. She hasn't played a major since winning the Australian Open in January 2017. 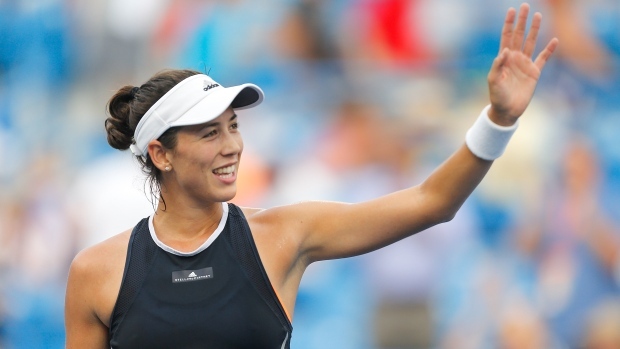 "If that happens, it will be the best match for quarterfinals," Muguruza said. Muguruza's preparations for the French Open have been far from ideal, winning just two matches on clay. After losing to Daria Kasatkina at the Madrid Open, she lost her opening match to Daria Gavrilova last week in Rome. But the elegant and powerful Muguruza is not worried. After all, she had lost 6-1, 6-0 against Barbora Strycova in Eastbourne last year in her final warmup tournament before Wimbledon, then won the title at the All England Club. "It stays less in your system like before, for sure," she said about her poor performance in Rome. "You move on faster. There is no point to be sad about what happened in Rome, because now it doesn't really matter. It's true I didn't play lots of matches. But I feel like I always had a chance, and they kind of slip away, all the matches somehow, so even if it's a little bit disappointing, I feel like I was there and I had my chances. Eventually, they will come to my side." After beating Williams in the 2016 final, Muguruza's title defence was ended in the fourth round last year by local favourite Kristina Mladenovic of France in front of a partisan crowd at Court Suzanne Lenglen. She said not being the defending champion this year will help her adopt a more relaxed approach. She was even unaware of her first-round opponent until asked how it felt to be up against former French Open winner Svetlana Kuznetsova in the first round. "Of course being the defending champion for the first time, it adds a lot of pressure and expectation, and for sure this year you think different," Muguruza said. "It's more relaxing, I guess." Muguruza was handed a tricky draw in Paris. If she beats Kuznetsova, she could meet Anastasia Pavlyuchenkova of Russia in the third round, then possibly meet American CoCo Vandeweghe, who recently made it to the final in Stuttgart.